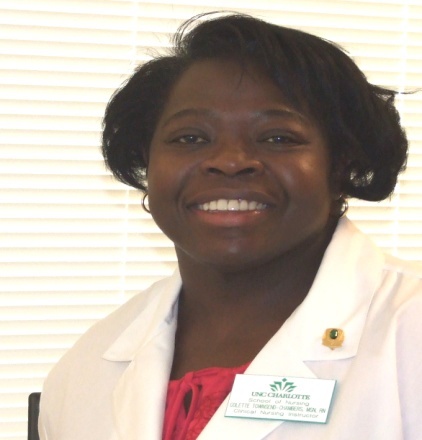 Colette Townsend-Chambers, MSN, RN received her Master’s in Nursing and Certificate in Nursing Education from the University of North Carolina at Charlotte. She has 25 years of nursing experience that includes medical-surgical, maternal-child, and a variety of community and public health settings including school health. It was during her time as a school nurse precepting nursing students that she developed the desire to teach and began to pursue a degree in nursing education. Ms. Townsend-Chambers is the Director of the College of Health and Human Services Learning Resource Center which includes a state of the art simulation laboratory. Her instruction is focused primarily in the clinical settings and skills lab with the LRC. Her research interests are in cultural diversity and women’s health, with a personal interest in educating the faith community on disease prevention. She is a member of Sigma Theta Tau- Gamma Iota Chapter, the America Nurses Association and Carolinas Healthcare Simulation Alliance-Piedmont. She is actively involved in overseas missions providing medical care in Guatemala and Jamaica.